Cut bread slices into half and then into long stripes. Take ghee in flat pan and sauté it for 3-4 minutes till it is slightly crispy. Mash the boiled potatoes, add chaat masala and mix it well. Take oil in a flat pan and roast peanuts into it. Arrange bread stripes in a plate. 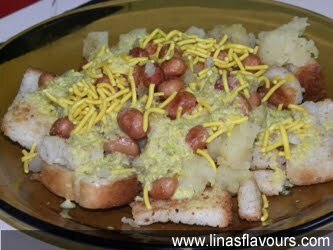 Sprinkle mashed potatoes, onions, peanuts, green chutney, date-tamarind chutney and besan sev. Serve immediately.